Utagawa Kuniyoshi (1797-1861) Military Brilliance for the Eight Views: Evening Bell At Todai-ji,1852. Oban. Wild Geese Descend, Sailboat(s) Returning Home, Clearing Mist, Sunset Snow, The Autumn Moon, Night Rain, Evening Bell, Evening Glow. In this print, the original title - Evening Gong at Quingliang Temple - is substituted by Evening Bell at Todai-ji, a Buddhist Temple in Nara which contains the largest bronze statue of the Buddha Vairocana. The picture however is of Akushichibei Kagekiyo, in a monk’s garb, armed with a naginata, ready to resist arrest. 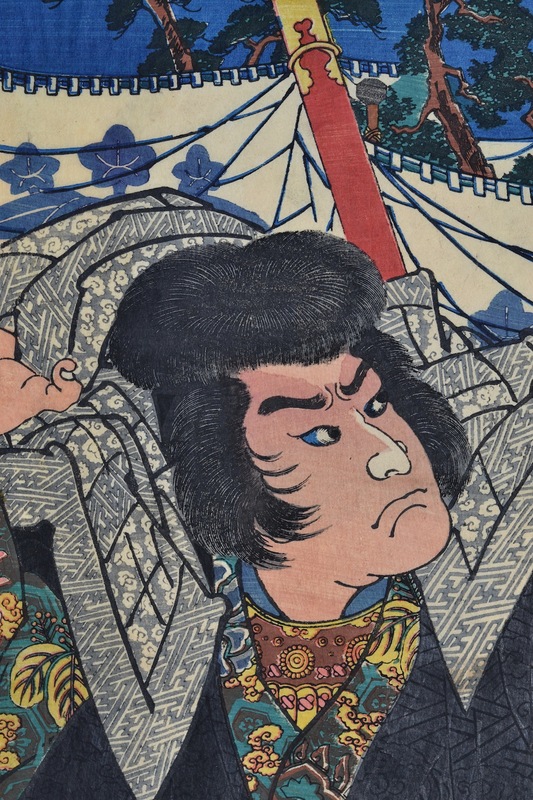 Kagekiyo was a Heike General, condemned to death by rival Yoritomo. The kabuki play Shusse Kagekiyo, tells how Yoritomo was planning to restore the Buddha at Todai-ji; Kagekiyo uses the event to plan an assassination. Tragically for him and his family, his plans misfire and it is he who is exiled and blinded. 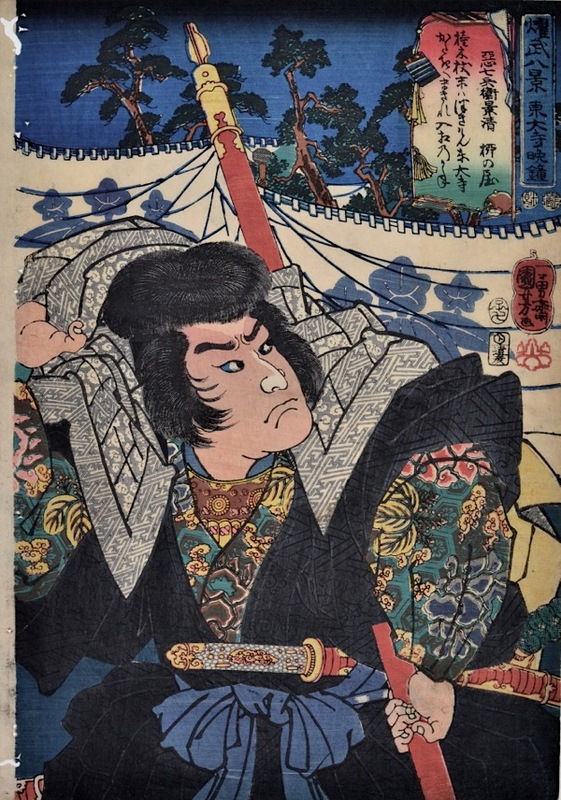 In celebrating the great Heike General, Kuniyoshi is flirting with subversion, but the choice of this one of the eight views is obvious, given the strong connections to place. He pictures the General looking up, as if hearing the temple bell. He peers out from under a monk’s shawl, holding the tools of his trade - a naginata (a long spear) and his sword. The large cartouche surrounded by militaria contains a poem celebrating the event. This is a justly famous series of prints, although they do not often come up for sale in such good condition. From the first edition with the three colour cartouche, the print is in fine condition with the exception of some minor holes to the left edge. The impression and colour are both outstanding. There is another exceptional portrait of Kagekiyo by Hirosada from 1848. A copy of this print is at the MFA Boston. Signed Ichiyusai Kuniyoshi ga with kiri seal. Published by Enshuya Hikobei.